What do you do with infuriating reviews? I won’t even defend the grammatical correctness of that statement in the picture: EVERYBODY has an opinion, most of them WRONG. WRITERS put their opinions out into the world where anyone can read them. Readers have opinions, too, and they get to express them in many places, one of which is the very modern REVIEW. This is the system now, people. For all the complaints, the reviewing systems are not going to disappear because they have enfranchised the disenfranchised billions who never had a platform before, and now they do. Moderators may keep the discussion to civil levels. Insecure bloggers will delete or alter comments they don’t like from opinionated readers who disagree with them. But I’m finding that I don’t spend much time reading the word of bloggers who don’t ever bother responding to their interlocutors. Not worth it. It has become a two-way street. Today a writer whined about her first 1* review, on an FB group I participate in – after writing a bunch of books! Lucky woman. Most of us get a 1* on the first book! Literally. We want reviews. We want feedback. We want to know when our arrow has hit their bullseye. But we don’t want their bullshite. We want praise. Glorious and unstinting and erudite and literate (not the same thing) praise. Because, to be able to write well (assuming that’s what the goal is; with some writers you wonder… but I digress), we have to sit at the keyboard and open all our veins to get enough blood to write with (takes lots of extra blood for all those sidetracks and failed attempts that occur with good writing… but I digress). Unconscious bullies. Jealous bullies. Bullies-who-had-a-bad-day. Nothing overt or aimed at readers or argumentative or likely to start a flame war online! There is enough garbage on the internet already. And we have the example of very popular writers: pick your favorite, and your favorite book, and go look at the reviews. All of them. ESPECIALLY the negative reviews. And remember, on AMAZON a 3* review is NEGATIVE/CRITICAL. Don’t believe me? Check those reviews on your favorite book’s page again: the 3*, 2*, and 1* are CRITICAL/NEGATIVE reviews. On Goodreads, 3* is good, 4* is great, 5* is ‘best book I ever read.’ According to their rubric (I don’t make these things up – what’s the point when you can check so easily?). On Amazon, 4* and 5* are good, 1*, 2*, and 3* are bad. Just to summarize that neatly for you. Find a place where it’s safe to vent (your own blog should be such a place, even though it’s pretty public, as long as you don’t identify anyone specific or any specific negative/critical review). Better still, complain only to friends and on closed writers’ groups, but it may not be as satisfying. Another review is another review. They keep adding up. SOMEONE is reading. And reader/reviewers write their thoughts and opinions in their reviews; other people may read the reviews and gain more understanding of what they may be choosing to read. This is good, especially with the negative reviews. But it ALWAYS points out to you that your ad copy, cover, description, back copy, quoted editorial reviews – everything up until the sample/Look Inside – is attracting certain readers. This should make you pause and THINK. I know I have a lot of thinking to do (I knew that already, but it was far down on the To Do list, and has moved up quite a bit) when I get a negative review from someone who probably should not have read the book. Because it’s really not their kind of book – and I can’t change it to BE their kind of book. The story’s already set in concrete, all the way to the end of the trilogy, even the parts I haven’t written yet. The style, tone, characters, plot – all implacably going to be very similar to what is already published. If someone states unambiguously they don’t like Mexican food, don’t give them a coupon and invite them to rate your Mexican restaurant. ‘Twill end badly on Yelp. So our signals are crossed. I’m glad they tried something obviously out of their regular reading zone. I’m very appreciative of their reviewing – most readers don’t, and it is an effort I appreciate. I’m not particularly pleased they rated the way they did, but I’m very glad they pointed out in their review what they liked and what they didn’t. That’s data for me, not for writing, but for marketing. Not sure this counts as a rant, but it is an attempt to bang my head on the wall. Without doing too much damage – I’m slow enough already. As an author, I do not go to my reviews and down rate the reviews I don’t like. It’s better if readers do that. Now I’m going to take a nap. All this ranting wipes me out. Especially the ‘tread lightly’ part. A reminder that Quozio and Stencil provide me ways to make images, gratis, and I would get a subscription if I needed more than a few graphics a month. This little bit of advertising – and the things I create with their tools – will have to be my form of payment for now. I AM grateful. The words, of course, are mine. What’s your favorite negative review? This entry was posted in Brain training, Promotion, Reading and reviewing, Writing - how to and tagged brain fog, contract with reader, disaster, Hard choices, the creative process, writer behavior mod on January 19, 2018 by Alicia Butcher Ehrhardt. I know that. I expected that. And my typo rate was, I thought, rather low, especially considering that I ended up being, for reasons too long to go into, my own proofreader. And I worked my tail off at it. It’s very hard to be critical of your own work. So? It’s part of the job. Now, I have found egregious (well, to me) typos in traditionally published books – one major book on writing that I use almost daily has ‘principal’ (main, or the guy who is in charge of a school) instead of ‘principle’ (fundamental truth or morally correct behavior) not once, but twice – so the author got it wrong and the proofreader failed to correct it; or a proofreader got it wrong, changed it, and the author didn’t catch the incorrect correction. Or they both have no idea they don’t know. I earmarked the place, and occasionally toy with the idea of sending a note to the author (which I don’t do – not my circus, not my monkeys). For future editions, you see. Because it is the kind of book that gets future editions. But it amuses me to know it’s there. And I still love the book. I had found ONE wrong word, ONE extra ‘s’ at the end of a word, and a couple of places where, when doing the final formatting pass through MS Word (to get widow and orphan control, running headers and footers, and right margin indents for the print version of Pride’s Children), WORD inserted some stupidities (specifically, leaving –” as the only thing at the beginning of a line, 5 or 6 times) after I published. They’re on my list of things to correct on the CreateSpace file (yeah, it’s on the to do list, somewhere in the 9000s). No one who reviewed has commented on those tiny typos, so they’re not all that significant in the flow (or my readers are being kind). And all but the first two are not present in the ebook, which didn’t go through Word. Acceptable. Imperfect, but not too much. Possibly because my youngest daughter mentioned it (she finally read the book!!! ), I was a little more attuned to a particular possibility when I was sitting in the doctor’s office yesterday, reading my own book. And then, wham! I saw it. I’m not even sure if it’s the same thing my daughter mentioned (though it may be), and I now know exactly what I did, and it really doesn’t affect the story that much. But I am now aware of a FLAW that I, as a perfectionist, can’t let stand. I moved the idea of putting an errata page on prideschildren.com up on the list – so those lovely people who purchase the first book in the trilogy in paper can correct their own copies (not that many readers, but still…), possibly now aware that they have the coveted First Edition – flaws and all. Or I can slink away, offering (consider yourselves offered to, if you are one of these wonderful people) a corrected copy as soon as I can make them, and being aware that they were either too kind to point this out to me, or, better, too engrossed in the story to even notice. There’s ALWAYS a good side. I caught it (before I had a chance to look up my daughter’s questioning whether I had it right). From reading it myself in a relaxed way, with nothing else to read. Rather than from it being scornfully pointed out by a reader. Rather less painful – or is it? Because I’m indie and self-published, it is both my responsibility and my right to fix it (so I don’t have principal for principle for all eternity of this print run). CreateSpace and Amazon make it easy to fix (haven’t done it yet, so that’s ‘easy in principle’ for now): I upload the corrected files (I believe), wait, and within a couple of days, I can hold my head up in public again. I have added (mentally – that darn To Do list is so darn long) a few things to the ‘look out for’ list for my AutoCrit editing passes. Especially since my brain appears to be losing its mind, I will now examine every single ‘s in each scene because the world not understanding that plurals don’t have apostrophes is its problem, not mine. I will speak sternly to the brain, and it will whine that it’s so overburdened already, and I will remind it that I’m in charge. Etc. I.e., I will improve my skills based on this little irritating contretemps. And because I’m indie, I don’t have to deal with a proofreader about the whole thing. So why am I making a big deal of this? Because professional means that you worry about these details, and that you try to make the next one have fewer (not less) errors. It’s good for me to see where improvement is necessary (believe me, there is a whole new process in place so this particular little error won’t recur). And it actually bolsters my belief that self-editing, and learning from your self-editing how to be a better writer is critical. I stand behind my own work, even in the tiny places. It’s okay to point typos out to me if you notice them. I just got a wonderful email back after my beta reader read – and liked – the next chapter. I strive to send her finished work. And her wonderful nitpickiness tells me what she likes, asks questions which lead often to some wonderful back-and-forth, and always mentions the little things. She found two. I love her for that. It also reinforces that doing the beta reading one chapter at a time has some significant advantages for me: a chapter is a reasonable size chunk of writing to deal with at a time. Things get noticed. And I can’t see how this would possibly work with a traditional publisher, the timing, and the diffusing of responsibility. All while the writer is supposed to be writing the next book. Not for me, anyway. So there it is. And no, you won’t find out from me what I did wrong (at least not until the Errata page comes out). If you didn’t notice, I’m not going to be the one to point it out. Nope. Welcome to the wonderful world of independent writing. PLEASE feel free to contribute your own stories. Thanks to Stencil and Quozio, my go to places for images. I’m resonsible for the silly words that appear in them. This entry was posted in CFS - living and writing with ME/CFS/CFIDS, Epublishing and tagged brain fog, contract with reader, self-improvement, the creative process, writer behavior mod on January 17, 2018 by Alicia Butcher Ehrhardt. The pattern is the same: though there may be many views of the archives, I assume it’s mostly one new person because a whole bunch of posts get a single view. I think this person may visit the archives page to see which posts might be attracting a few minutes of their attention. And so, for those of you in this category, first I say Welcome! And then I suggest that you leave a thought. A comment on a post somewhere. An opinion. A like. Even an argument, if civilly stated. I love to get readers, and I like even better having my conversational gambits (for that is what blog posts are, conversation starters) taken up by someone new. I won’t sell you anything (beyond the gentle suggestion that if you like my prose enough to read that many posts, you might enjoy my fiction (free short stories available, one novel ditto on Amazon, and more to come). But it’s always nice to know who’s listening. Stay a bit. Chat. Visit with an idea or another commenter (I don’t turn comments off for older posts). Gimme a few words back. I don’t bite – I just have opinions, which I like to support with whatever data I have. The internet of ideas depends on you, too. This entry was posted in Random writings, Reading and reviewing, Short posts, This writer's life and tagged blog construction, contract with reader, inspiration, Life on January 16, 2018 by Alicia Butcher Ehrhardt. Caleb Pirtle, III, is undertaking a monumental task. Mind you, he is vastly overqualified for it, as he has SEVENTY books published, and runs a well-known eponymous indie book site* with his wife, Linda Pirtle (also an author of mysteries), showcasing mysteries and other genres, and has been doing so far longer than I’ve been involved in the online part of writing and indie publishing (I started reading the blogs in 2011, having this one in 2012). Caleb serialized Pride’s Children way back when I was starting to publish Book 1 one scene at a time. We have become online friends through extended comments on his site – his opinions, always well expressed and nuanced, lend themselves to conversations on writing and publishing topics. Here are the first five and the second five. I’ll update this post (and you should bookmark his and Linda’s blog) as he continues listing the books he thinks should be on the list. He is always open to comments, too. 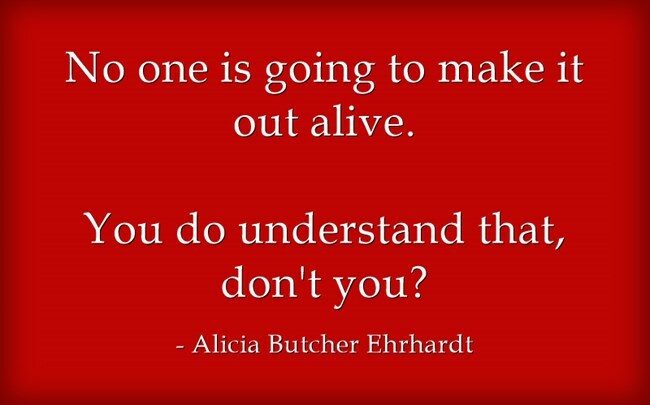 This entry was posted in Epublishing, Short posts and tagged inspiration, publishing on January 12, 2018 by Alicia Butcher Ehrhardt. A summary of three lives intertwined in China, and the parents who fought for their daughter. Her life – and theirs – are worth what it cost. This entry was posted in Gen. Musings on January 7, 2018 by Alicia Butcher Ehrhardt.